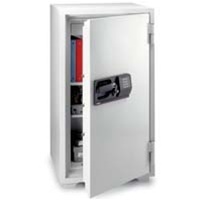 FIRE-SAFE® Office Safes - 1.6 cu. ft. capacity, file rack and multi-position shelves make the Fire-Safe® Office Safe a versatile, hard worker in any office setting. UL Classified 1-hour fire protection rating and your choice of combination or electronic lock. Capacity: 5.8 cu. ft. N/A cu. in. Ship Weight: 624 lb. 283 kg.